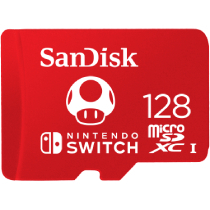 With transfer rates up to 100MB/s(1), the SanDisk microSDXC card for Nintendo Switch delivers consistent high performance, so you can load games fast. *1GB=1,000,000,000 bytes. Actual user storage less 1128GB: Up to 100MB/s read speed; up to 90MB/s write speed. 64GB: Up to 100MB/s read speed; up to 60MB/s write speed. Based on internal testing; performance may be lower depending upon host device interface, usage conditions and other factors. (1) MB = 1,000,000 bytes. 230 year warranty in Germany, Canada, and regions not recognizing lifetime warranty. See www.sandisk.com/wug.